Inbox Zero: What is Inbox Zero and is Zero Inbox Possible in 2019? What Is The Inbox Zero Approach? As a hard approach to managing your emails, Inbox Zero is designed to help keep your inbox clear or almost empty so that you don’t have to stress over your emails. Per Mann, it is how to use your time to check your to-do list and your email so that you could save more time and money in the long run. Mann has taken the time to identify five potential actions for each of your inbox messages. This is the Inbox Zero process. The “Delete” phase is executed from the email feed. You don’t move emails for deletion in any folder. You delete them. 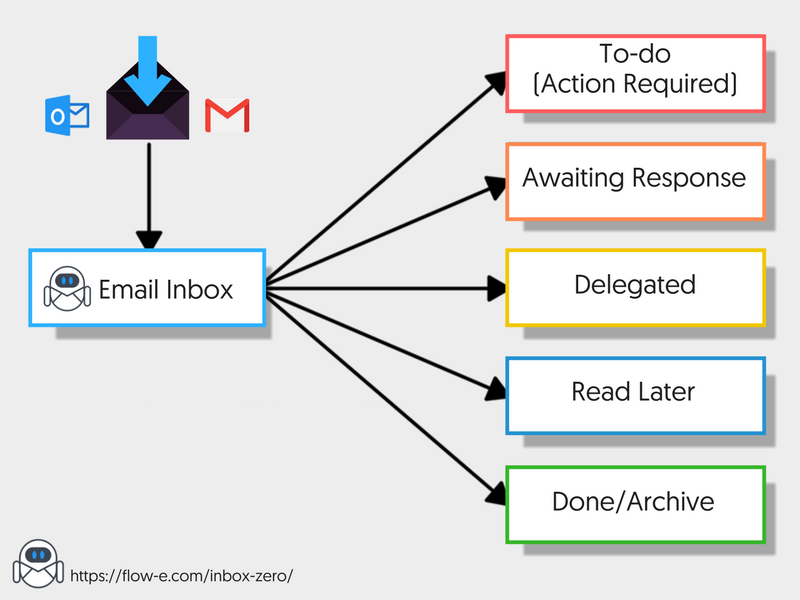 Using Flow-e as a mean to combine Gmail and Inbox Zero approach is super flexible, you can even mold it to many more productivity methodologies, such as GTD and Personal Kanban. Avoid procrastination by implementing a systematic approach to managing emails and tasks. The answer may lay in the simple Inbox Zero principles applied to Outlook. Step-by-step instructions on how to manage project with Flow-e and Inbox Zero approach. · Never leave the email client open, you must do an action for each of your emails and do so immediately. · Take the time to process your email several times per day may be at the top of the hour. · Delete or even archive as many of the messages as you can possibly do each time you’re in the email, if you have 2 minutes, use it wisely and take care of some emails, it will save you a lot of time in the future. · Respond to new messages immediately if you can do so in under 2 minutes. · Messages that require more time should be moved to be dealt with later: You can put them in a separate file, make sure that you set up files for each topic and keep track of these files so that you’re always able to put your fingers on what you need when you need it. · Take time daily to respond to the emails in this folder to keep them current. Merlin Mann has introduced the zero inbox method to Google Tech Talk. Here, per Radicati’s email stat report, professionals can save time and send on average 126 emails daily. This number is ever increasing as the practice is fine-tuned and as people work toward the goal of accomplishing the task set before them. With the vast amount of emails that flood the inbox, it’s difficult to remain calm; productivity can take a huge hit. We can hardly imagine a clean inbox with no unread emails. Ideal for those who have customer service managers who are continually receiving large numbers of emails. Here we explain a strategy that works well for organizing emails so that you can select what works the best for your situation, use it, and get back to what you enjoy so that you’re not wasting energy trying to stay caught up. There are many great approaches to reaching zero inbox; you can focus on your organization and your management form by creating multiple mailboxes in which to use filters and labels. One issue is that you’ll have to determine which method works best for your needs. What will do the best job for you? Here, we’ve taken the time to compile four great strategies that will work regardless of your habits. However, before we begin to examine the strategies, let’s take a moment and review the five commandments of the methods as Merlin Mann has coined his original method. Just as in everything else, Pareto Principle holds true: 20 percent of your emails will take up 80 percent of the focus. Don’t argue with it. Accept that you’re going to be able to handle that 80 percent quickly. This is true, you aren’t going to be able to read every email you get. Input is always going to exceed the output. That’s fine. The sooner you realize you can’t do it all, the sooner you can concentrate on what’s the most important and finish the rest of them later. It’s an email, not a novel, a thesis, or an essay. It’s okay to give one-line answers, 10 paragraphs aren’t okay, readers will quit reading after the second line if it’s not clear and concise and easy to read. Bullet points are wonderful they keep things neat and tidy and make it easier than ever to read and analyze. Big block text slows readers down, and they have to find their glasses, if they have to go looking for glasses to read it, they’re not likely to finish reading it, and they’re much more likely to delete it, if it’s important, keep it short, sweet and to the point. Don’t stress over feeling guilty, anxious, or whatever else when you open your inbox, just do it. It’s all overwhelming. Just focus on what must be done, take the time to do it and move on as quickly as you possibly can. Be honest with yourself regarding your priorities and be realistic about what you expect. We’ve all had that gut instinct on what does and doesn’t deserve a response and what must be deleted. So it’s vital to learn the difference and move forward with it as quickly as possible. Now, let’s find out how you can achieve inbox zero. We are everyday emailers and we will handle the inbox and reply to our messages as they flow in. This is for the busy person that hasn’t taken the time to organize their inbox and learn strategies and tricks. Organized processing for managing your emails is the best part of Everyday Emailers per Mann’s original method; it’s rooted in the form of time management and getting it done. We’re always getting emails from employees, customers, supervisors, investors, dad, mom, aunts, uncles, the media, and more. To navigate this minefield, it’s challenging at best especially if you’re busy with kids, work, family and more. 1) What does this mean to me and do I care? 2) What do I need to do with this email? 3) What is the most prudent course of action for this email? p.s this is an example Inbox Zero workflow board in Flow-e.
Don’t forget to delete any email you don’t need. This happens while you are processing your email feed. Each email should easily fit into one of these columns/folders and keep the inbox clear. Let’s take a moment and go through these five actions and assign an email to move them to the right folders. What is the relevance of this email for me? This can be challenging to determine. We want to keep everything, I mean after all, what if we need it later? We read it, re-read it, read it again, and so on until we determine that we don’t need it. Delete. This method stops the floating meaningless emails from clogging up our email boxes and our minds. It takes up too much space in our heads. Am I the right person for this email? Or is someone else better at this than I am? Can we CC ourselves and move it to a delegate folder and check it later? Can I respond to this in less than two minutes? If so, do so and move on or archive. Is this going to take me longer than two minutes? If so, move it to the “To-do/Action required” column/folder and move on. This will save a lot of time. Always strive to complete your task in two minutes whenever you can. Act on the email if you can do so otherwise, move it on. Save your time and do it now, or defer it for later. Set time aside for the email and take care of it. Set aside a time each day to do what you need to do. Tony Hsieh takes three hours to go through his Yesterbox (a column dedicated to emails from yesterday), so he knows that he must set aside three hours each day. If he has another meeting, he must reschedule his emails. Will this be longer than 10 minutes? If so, set aside the time required to do the research, deal with your email and then take care of it. Then you can schedule a time to deal with the proper action for your email as if you were in a meeting. You don’t blow meetings off so don’t blow your emails off either, these are just as vital as your meetings, and you must deal with them accordingly each and every day. Set up a calendar appointment and focus on the subject lines in your emails and set them into the right folders. Example: Use Flow-e email and schedule it to remind you later if you must. That way, you’ll know that you have plenty of time to reply to your emails and respond accordingly. 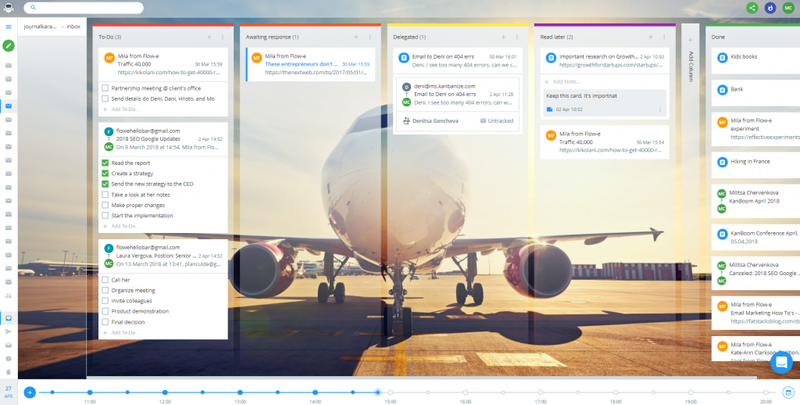 Step-by-step instructions on how to use the Inbox Zero method to manage a project, prioritize your work, and visualize your workflow with Flow-e.
Do you feel cluttered by the number of emails you receive? If you haven’t adopted any productivity method yet, then Inbox Zero is one of the most natural methods to start with. We will show you easy to follow, actionable tips and trick, which will let you reach the zero inbox state. And it feels so good when this is accomplished!